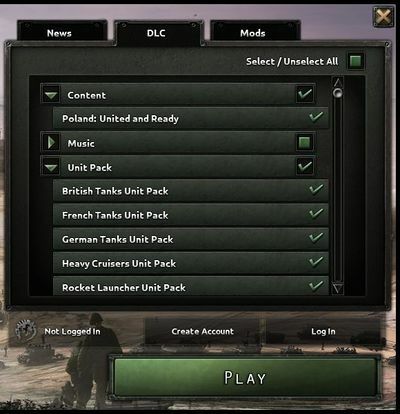 Downloadable content (DLC) is content built by Paradox Development Studio (PDS) as an extension or add-on to Hearts of Iron IV. They are modular in nature, which means that a player can choose to play with or without a given DLC by checking them out at the launch menu. An expansion DLC is normally accompanied by a free patch that gives players most of the new content as not to hinder the playability of the game. As such, most DLCs are seen as optional content for players who wish to have a better gaming experience in exchange for some monetary support. Multiplayer games also benefit from this compatibility, that is to say, if the host has a gameplay DLC (expansions and flavor packs) the player does not, the game acts as if the player has it. The base game is required for any and all DLC relating to the game. While cosmetic/music DLCs can be used with any game version, content DLCs can't be used prior to the version they were released with. Intense Online Combat: Battle in both competitive and cooperative multiplayer for up to 32 players. Featuring hotjoin and cross-platform multiplayer. Expansions change the game considerably; introducing new and improved gameplay mechanics as well as many kinds of flavor and various balance tweaks (included in the accompanying free patch). Note: For more detailed information on a particular expansion click on its icon. Together for Victory 15 Dec 2016 Announced on 10 Oct 2016. Death or Dishonor 14 Jun 2017 Announced on 26 Apr 2017. Equipment Conversion: Update your arsenal by converting older units - or make use of captured enemy vehicles and gear. New Diplomatic Interactions: License military technology to bring other nations' weapons to the field or sell your advances to the highest bidder. New Puppet Interactions: Fascist countries get new subject levels like Reichskommissariat, with access to licenses, industry and strategic resources. The instated governments are held in an iron grip, making it harder for them to break free. New Music and Art: 3 new thematic musical tracks from composer Andreas Waldetoft, new art content for the four focus nations, and new troop voiceovers. Waking the Tiger 08 Mar 2018 Announced on 15 Nov 2017. People's Republic of China through the war, guided by your own vision of the future. Japan: Two major Axis powers now have alternate history paths, including the chance to depose Hitler or restore democracy to Japan. General Traits and Abilities: Generals’ traits can now unlock powerful Command Power abilities, allowing great flexibility and creativity. Decisions and Missions: Historical decisions and national missions give new places to spend Political Power, from domestic politics to start special projects. And more: Scavenge equipment from the battlefield, use Volunteer Air Corps, as well as new music and art. Man the Guns 28 Feb 2019 Announced on 19 May 2018. Admiral Traits and Skills: Tailor and level up your Admirals with new traits and skills. Shipping route controls: plot new routes for your shipping and navies by marking areas you want to avoid. Flavor packs add new events, event pictures and unit models often specific to one nation or group. Adds a unique national focus tree. 3D art for infantry and some more well known tanks and planes. 2D art for tanks & planes, complete with flavor names. 2D art for ministers, generals and country leaders. Complete Polish voice acting for military units. Music packs add new music created after the game's release to the game's soundtrack. Allied Radio: Composed by Tobias Gustafsson. German March Order: Composed by Andreas Waldetoft. Also includes the War Stories e-book pack. 06 Jun 2016 Composed by Sabaton: Adds 5 World War II themed tracks by Sabaton that play during the game. (can't be used on LP videos due to 3rd party copyright). 26 Jan 2017 Composed by Sabaton: Adds 10 tracks illustrating moments of World War II with passion and power chords! (can't be used on LP videos due to 3rd party copyright). Cosmetic packs add graphical enhancements to the game, whether by additional unit models, landmarks or portraits. Heavy Cruiser Pack: Adds 7 heavy cruisers available for both Axis and Allies, including Exeter, Prinz Eugen and Mogami. E-books  are books written based on the Hearts of Iron IV game. These, however, do not impact the actual game in any way whatsoever. 06 Jun 2016 A 23-page book with art from the creation of Hearts of Iron IV. 16 May 2016 Written by Aaron Rosenberg: A branching narrative (gamebook) about a young British pilot during the Battle of Britain. Be wise! The decisions you make will influence which skills you learn, your relationships with other characters and even the story’s outcome. ↑ Forum, HOI4 Anniversary Diary (and Free DLC), 2017-06-06 | DLC is added automatically to the base game. ↑ The e-books are located in the /Hearts of Iron IV/ebook/ folder.